For most of the 1800s, leaders in Washington were concerned that Hawaiʻi might become part of a European nation’s empire. During the 1830s, Britain and France entered into treaties giving them economic privileges. In 1842, Secretary of State Daniel Webster sent a letter to Hawaiian agents in Washington affirming US interests in Hawaiʻi and opposing annexation by any other nation. He also proposed to Great Britain and France that no nation should seek special privileges or engage in further colonization of the islands. Buckingham Palace gets its name from an eighteenth-century Tory politician. John Sheffield, 3rd Earl of Mulgrave and Marquess of Normanby, was created Duke of Buckingham in 1703. He built Buckingham House for himself as a grand London home. Queen Victoria was the first sovereign to take up residence in July 1837, just three weeks after her accession, and in June 1838 she was the first British sovereign to leave from Buckingham Palace for a Coronation. Since then, Buckingham Palace has served as the official London residence of Britain’s sovereigns and today is the administrative headquarters of the Monarch. It houses the offices of those who support the day-to-day activities and duties of The Queen and The Duke of Edinburgh and their immediate family. The Palace is also the venue for great Royal ceremonies, State visits and investitures. The Throne Room, sometimes used during Queen Victoria’s reign for Court gatherings and as a second dancing room, is dominated by a proscenium arch supported by a pair of winged figures of ‘victory’ holding garlands above the ‘chairs of state’. George IV’s original palace lacked a large room in which to entertain. Queen Victoria rectified that shortcoming by adding in 1853-5 what was, at the time of its construction, the largest room in London. The balcony of Buckingham Palace is one of the most famous in the world. The first recorded Royal balcony appearance took place in 1851, when Queen Victoria stepped onto it during celebrations for the opening of the Great Exhibition. It was King George VI who introduced the custom of the RAF fly-by at the end of Trooping the Colour, when the Royal Family appear on the balcony. The Élysée Palace is the official residence of the President of the French Republic, containing his office, and is where the Council of Ministers meets. It is located near the Champs-Élysées in the 8th arrondissement of Paris, the name Élysée deriving from Elysian Fields, the place of the blessed dead in Greek mythology. In 1786, it was given to Louis XVI, who later sold it in 1787 to his cousin, the Duchess of Bourbon. The hotel took the name of its owner “Hotel de Bourbon.” During the Revolution and after the arrest of the Duchess in April 1793, the Hôtel de Bourbon later took on different purposes. Released in 1795, to support herself, the Duchess of Bourbon began to rent the ground floor of the hotel and gave permission to his tenant, a merchant named Hovyn, organize dances in the lounges and garden. It was at this time that the hotel took its name Elysée by reference to the nearby promenade. Later, Napoleon resided here (March 1809) until his departure for the Austrian campaign; he took possession of the Elysée in 1812, which witnessed the last hours of the Empire – he signed his abdication there. The Elysee Palace later became the residence of Tsar Alexander during the occupation of Paris by the Allies and was made available to the Duke of Wellington in November 1815. December 12, 1848, the National Assembly by decree assigned the “Elysée National” as Residence of the President of the Republic. The Prince-President Louis Napoleon moved there December 20, 1848. After the fall of the Empire, the Palace resumed the name of Elysée National. The Elysée Palace remains the official residence of French presidents. George Washington, the new nation’s first President, selected the site for the White House in 1791. The cornerstone was laid in 1792 and a competition design submitted by Irish-born architect James Hoban was chosen. It was rebuilt and President James Monroe moved into the building in 1817. During Monroe’s administration, the South Portico was constructed in 1824; Andrew Jackson oversaw the addition of the North Portico in 1829. The Executive Office Building is now known as the West Wing. Roosevelt’s successor, President William Howard Taft, had the Oval Office constructed within an enlarged office wing. At various times in history, the White House has been known as the “President’s Palace,” the “President’s House” and the “Executive Mansion.” President Theodore Roosevelt officially gave the White House its current name in 1901. President Theodore Roosevelt (1901-09) was not only the first President to ride in an automobile, but also the first President to travel outside the country when he visited Panama. President Franklin Roosevelt (1933-45) was the first President to ride in an airplane. There are 132 rooms, 35 bathrooms, and 6 levels in the Residence. There are also 412 doors, 147 windows, 28 fireplaces, 8 staircases and 3 elevators. When the seat of Hawaiian government was being established in Lāhainā in the 1830s, Hale Piula (iron roofed house,) a large two-story stone building, was built for Kamehameha III to serve as his royal palace. But, by 1843, the decision was made to permanently place a palace in Honolulu; Hale Piula was then used as a courthouse, until it was destroyed by wind in 1858 – its stones were used to rebuild a courthouse on Wharf Street. In Honolulu, Kekūanāoʻa (father of two kings, Kamehameha IV and V) was building a house for his daughter (Princess Victoria Kamāmalu.) The original one story coral block and wooden building called Hanailoia was built in July 1844 on the grounds of the present ʻIolani Palace. The cornerstone for ʻIolani Palace was laid on December 31, 1879; construction was completed in 1882. In December of that year, King Kalākaua and Queen Kapiʻolani took up residence in their new home. The first floor consists of the public reception areas – the Grand Hall, State Dining Room, Blue Room and the Throne Room. The second floor consists of the private suites – the King’s and Queen’s suites, Music Room, King’s Library, and the Imprisonment Room, where Queen Lili‘uokalani was held under house arrest for eight months in 1895. After the overthrow of the monarchy, `Iolani Palace became the government headquarters for the Provisional Government, Republic, Territory and State of Hawai‘i. The palace was used for nearly three-quarters of a century as a government capitol building. Buckingham Palace beat them both. In 1876, Alexander Graham Bell, a Scot living in Boston, demonstrated his telephone to Queen Victoria who ordered a line from Osbourne House in the Isle of Wight to Buckingham Palace in London. 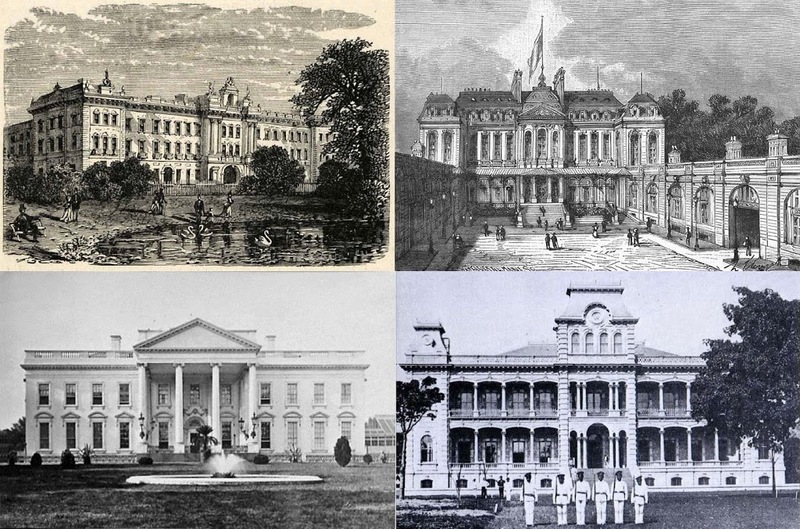 The image shows (top L-R) Buckingham Palace, Élysée Palace, (bottom L-R) White House and ʻIolani Palace (1882-3.) I have added other images to a folder of like name in the Photos section on my Facebook and Google+ pages.